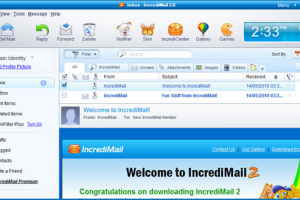 "IncrediMail 2 | The email client that brings fun to your emails"
The freeware download presented here is called IncrediMail 2. It’s a dedicated email client application you can install on your personal computer (PC) to facilitate receiving and sending email messages to your family members, peers, colleagues, acquaintances, among others. Incredimail is around since quite a while and over the years it has grown to be the IncrediMail 2 email client with essential and special features you can download here. Some people have to spend hours handling email and as such you might as well have some fun while taking care of that task. As such, you might be interested in IncrediMail 2, already preferred by many people because of the importance given to the visual aspect. IncrediMail 2 provides you with an easy-to-use, intuitive and visually attractive graphical interface, without leaving out other essential aspects or impacting its performance. Besides of the attractive and entertaining aspect that sets its style apart, IncrediMail2 encompasses all the functionalities and features you might expect from any standard email client application. So, let’s enter into the details of IncrediMail 2, giving some more information about its features. The latest version at the time of writing, offered here as a freeware download, consists of an improved design, enhanced stability, powerful email search functionality, and more. The new design is aimed at being not only more attractive but also user-friendly, allowing you to customise mail folders with colours, email previewing and browsing through your email list will also be more convenient. FastSearch is introduced, showing results as you type, capable of showing results in less than a second, even when you have over 10,000 emails. It also features search filters, suitable for filter emails and attachments including Word documents, PowerPoint presentations, videos, images and many other file types. Furthermore, a powerful and smart new address book is introduced, enabling the creation of contact groups, attaching a personal display picture for each contact, and more. Attachment preview functionality is also added to this version, personal contact icons, animations, effects, new skins and a customisable status window display are just some other features of this versatile email client. IncrediMail 2 is a rather unique email client, combining the fun side with the practical one. As such, when creating a new email with IncrediMail 2, you’ll notice some curious features, writing machine sounds and fun three-dimensional (3D) effects that will appear when sending emails, there’s a collection of backgrounds, fun sounds, animations and emoticons. Furthermore, there’s an information bar indicating the time or a calendar, animated email notification and smart FastSearch functionality. So, if this sounds like an email client you’d like to give a try, consider proceeding to the download to find out all the details about it and start having fun managing email and communicating with your contacts.